Optimizing the limited real estate in tiny microfluidic devices is important to satisfy the increasing expectations of the users of microfluidic devices. Users expect maximum functionality and multiple parallel operations from a single microfluidic device. The challenge of optimizing the limited real estate extends to rotating microfluidic devices, despite the many physical advantages of these devices. 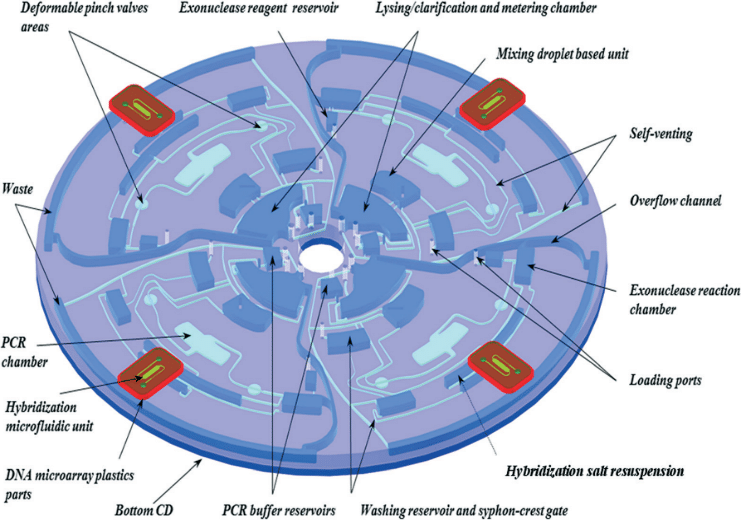 Rotating devices, which harness the rotational energy to perform microfluidic operations, are called compact disc (CD) microfluidic devices. For over a decade, CDs have consistently showed merit in rapid immunoassaying and clinical biochemistry for blood diagnostics. They are used as micro total analysis systems (μTAS), in which several individual assays are embedded and run simultaneously on a single chip. They operate on simple inexpensive motors programmed for hands-free control and do not require external actuators such as magnets or surface treatments. Basically, CDs are great! However, there is no such thing as a free lunch. Due to unidirectional (radial) centrifugal forces, CDs run out of real estate faster than non-rotating microfluidic devices. Fluids only move radially outwards, limiting the number of analytical steps a CD can perform. Figure 3. Schematic highlighting various body forces applicable to a radial column of water inside the channel of a CD. Notice the radially outward-acting centrifugal force. In Gorkin et al , pneumatic pumping is proposed to overcome the uni-directionality constraint of CDs. The idea is to store the centrifugal energy as compression energy and release it back to launch the fluid towards the center. 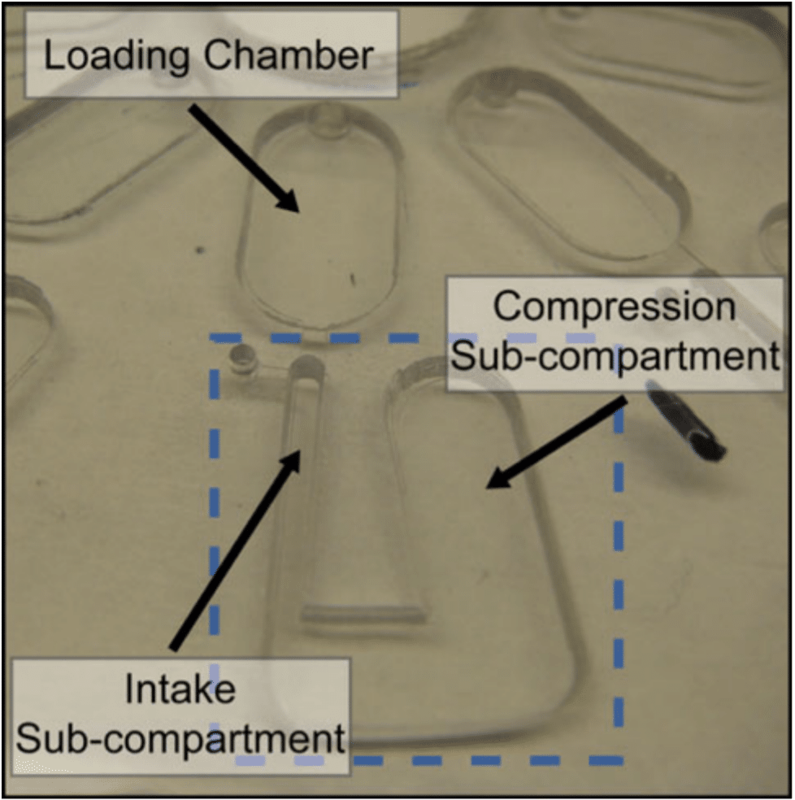 The images below show a relatively simple microfluidic chip with three chambers: a loading chamber, an intake sub-compartment and a compression sub-compartment. 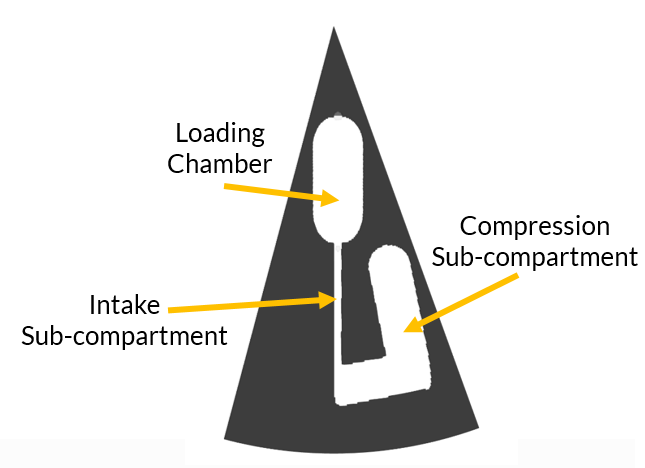 Fluid enters in the loading chamber, then moves down through an intake sub-compartment, to the compression sub-compartment where the air is trapped. Once the air is trapped, the CD is rotated at a certain angular velocity, causing the trapped air to compress. When the air cannot compress anymore (because it’s reached steady state), the rotation speed is decreased or completely turned off (is someone doing this or is the device doing it? ), causing the fluid to pump back towards the loading chamber. This last stage is the relaxation stage. The 5 stages of the pneumatic pumping process are shown below. Different rotation speeds cause different levels of compression of the air in the compression sub-compartment. Higher rotation speeds will push the fluid harder against the air, compressing the air more. However, there is a limit to the amount that the air can be compressed. In fact, the compression of the air increases asymptotically above a certain rotation speed. The volume of compression sub-compartment reduces as the rotation speed increases. The liquid position at intake is the distance from the center of the disk to the level of fluid in the intake sub-compartment. This distance increases, i.e., the fluid gets farther from the center, as the rotation speed increases. Experiments are at the core of designing microfluidic devices. But conducting enough experiments and maintaining a perfect control environment for each experiment can become prohibitive. Complex designs require complex experimental setups and analysis. FLOW-3D’s accurate and comprehensive multiphysics modeling capabilitiesprovide insights about microfluidic designs and how to optimize them. I will showcase how FLOW-3D fares against experimental and theoretical results for the CD microfluidic device discussed above. The sequence of images offers a visual comparison of experimental and FLOW-3D simulation results. A two-fluid (air and water) compressible model was used to simulate the fluid dynamics inside the chambers for different rotation speeds. Quantifying these visual comparisons in the plot below using regression analysis gives excellent correlation (R2>0.99) between FLOW-3D and experimental results, and FLOW-3D and analytical results. The simulation also reveals the approach toward steady state for different rotational speeds. The animations below show the kinetic energy fluctuations for the CDs, at 1000 rpm nd 7000 rpm. The higher speed forces a quicker steady state but rapidly fluctuating water levels until the steady state is reached. The reverse is true for the lower speed simulation. Overall, FLOW-3D accurately validates the experimental results. Minor errors can be attributed to inaccurate geometry (CAD) creation and/or strictly defining the interface between the water and the air. 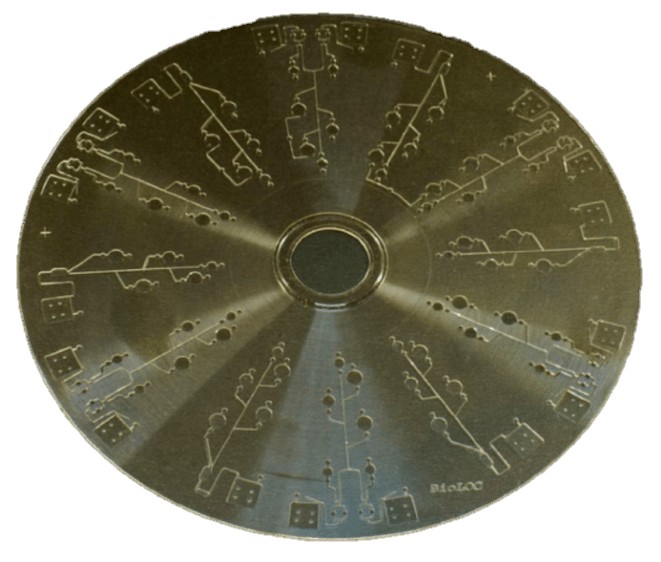 This case study shows that FLOW-3D can be effectively used to validate experimental results and increase the confidence in compact disc designs. Please write to me at adwaith@flow3d.com to discuss a microfluidic device or a process you are working with.